New invention sports active preamp circuit, volume and tone knobs and boost switch. Dubbed the Valvebucker, the pickup features a tube-amplified active preamp circuit sporting triode and pentode NOS tubes. There’s also a three-way switch for different sounds, a volume, a tone knob and an additional boost switch. The Valvebucker is powered by an XLR microphone cable running from a floor unit that is the size of a standard effect pedal and is powered by a 12V AC supply. The floor unit also features a second input to connect a standard-pickup-equipped guitar, as well as a true-bypass A/B switch to alternate between the instruments. 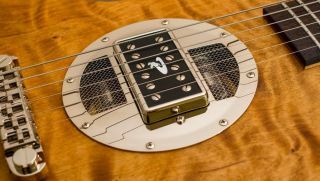 For more information on the Valvebucker, as well as audio samples of the pickup in action, head over to Ruokangas.